A Yawn of My Hedgehog. 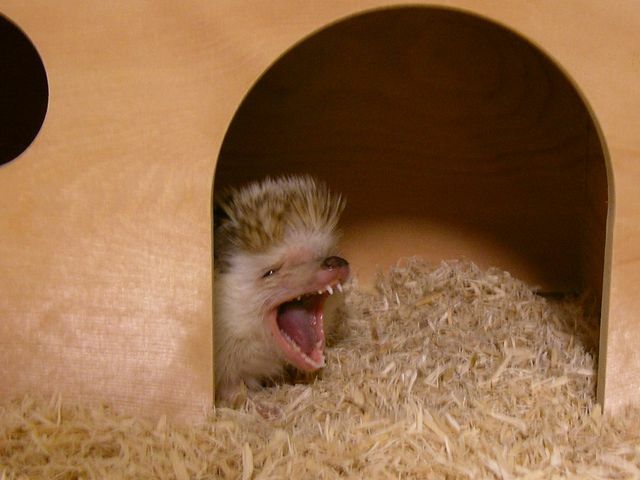 You probably know your hedgehog has teeth (how else would he crunch his little cereal-like insectivore food?) but did you know these teeth may need some regular attention just like yours, your dog's, and really anyone else that has teeth? Hedgehog tooth diseases are real and shouldn't be ignored. They can cause serious pain and infections to your hedgehog and if you have ever had a toothache you know it's no fun! Hedgehogs can have up to 44 tiny teeth. They have incisors, premolars, molars, and canine teeth just like us. They get these teeth when they are just 3 weeks old which means they have them almost their entire lives to allow them to chew and grab their food. Most hedgehog owners don't brush their hedgie's teeth but this doesn't mean the teeth can't be cleaned professionally by your exotic pet veterinarian or that issues won't arise with their teeth. To get hedgehog teeth professionally cleaned your hedgehog will need to be put under anesthesia. It is then that those little teeth can be cleaned, polished, and radiographed (x-rays). Problem teeth may need to be extracted. This is the same procedure that is done on cats, dogs, and other pets with teeth but there is still anesthetic risk involved anytime your pet goes under anesthesia. Blood screening and IV fluids should be discussed prior to the procedure with your veterinarian to assure the safest dental prophylaxis possible. If you do want to try brushing teeth do not use toothpaste. Try using a wet Q-tip and gently rub all of the teeth with the Q-tip. Focus primarily on the back molars and on the side of the teeth that you can see. Don't stress out your hedgehog and do be gentle. If the gums start to bleed a little don't panic! This just means they are not used to being brushed and may not be very healthy. If you see a large amount of blood or are able to see any of the tooth roots, get your hedgehog into see the veterinarian. If there is a lot of tartar built up on the teeth (brown or black coloration), you won't be able to get it off with brushing. Your fingernail may be able to gently scrape it off the tooth (although hedgehogs don't typically allow this) but otherwise, a professional cleaning with an ultrasonic scaler is your only other option. These three things are what your veterinarian might call the black or brown stuff on your hedgie's teeth. It is made up of saliva, food particles and bacteria. It is a problem because it makes the teeth unhealthy and sits on the gum line. The gum line is a direct pathway to your hedgehog's blood supply which therefore allows the bacteria to go to all the major organs in the body. A large accumulation of one of these three things can lead to a systemic infection in your hedgehog. You can usually brush off the softer plaque, but usually, tartar and calculus are too hard to brush off without a professional cleaning. A tooth root abscess is when the root of the tooth (which you cannot see without radiographs on a healthy tooth) has a pocket of pus surrounding it in your hedgehog's mouth. This is due to a bad tooth infection and may sometimes cause a bump under your hedgehog's eye on the side of the face where the bad tooth is. This bump may look like a zit and may pop up pretty quickly. If you see a bump like this (or any lump on your hedgehog), get him to see the veterinarian as soon as possible. The bad tooth will need to be extracted, the rest of the teeth cleaned, and your little hedgehog needs some serious pain medications and antibiotics.